It sounds like you got a few things hooked up wrong... Take the plug on the ECM side of both the coolant and the intake air temp leads and then take a digital voltmeter and measure the ohms on the ECM plug. Then toggle the switch the line should go open (inifinite ohms). ECT lead should show at the ECM 3.3K ohms and open. IAT lead should show at the ECM 39K ohm or 56K ohms and open. Then change up your diagnostics... Take both ends sensor and ECM ends and probe both pins one on each side. On the OPEN position of the switch in the previous test both ends should be a direct short or 0 Ohms. i have this mod also, sometimes it works and sometimes it dont. I have the latest and greatest flash from a smarty. any ideas? Mike is right one. You need to do a simple test and see what your ohms are looking like. It's sooo hard to tell what is going on inside that box with everything the same color..... 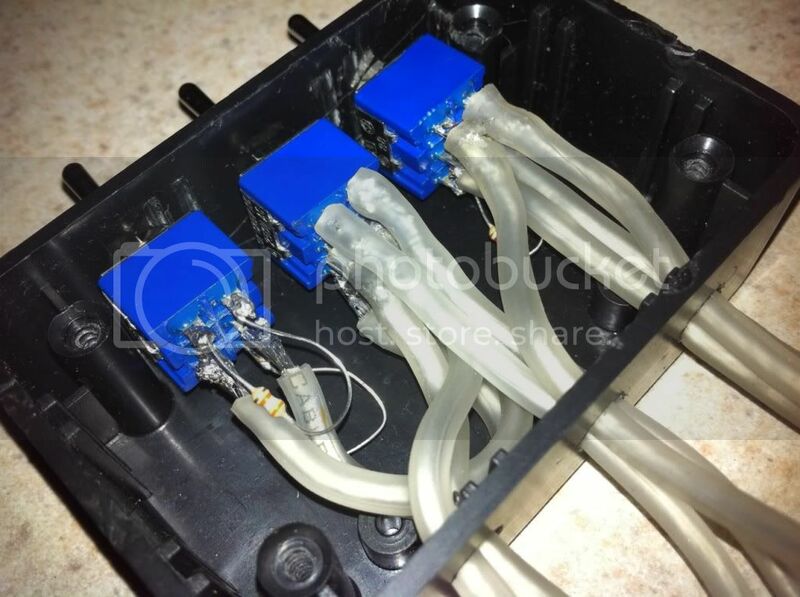 Since your coolant gauge isn't working, I'm saying you have something funny with your ECT harness, like it is always on.... Could you take a picture of the whole system so we can see where the wires are going to the plugs? I know your talking to OP. Mine shows coolant at 123 degree and IAT at 26 degree when i flip my switches. just don't work all the tie. That's interesting... are your switches working all the time? I think so. I can see the changes on my quad display when i flip the switches. That sounds more like an ECM problem. Like for some reason it doesn't want to figure out what to do. Now as for a fix.... That I'm not sure??? welder i think your right, i have a quadzilla and it to has a hi idle function and it no longer works and thats why i bought a hi idle box. Not sure on what to do besides buy a ecm. hhmm..interesting..i am thinking ecm also. I already tryed that. I sent it in to quad and they said it was fine. Sent it back and it still didn't work so i tossed it on my Buddy's truck ( he also has a quad) and it works on his truck. My truck has a gremlin. Yep... Sounds like something is wrong on your side... ECM most likely... Did you try having the dealer flash it? No. they want $100 for that. Unless you're good like me and get it for free!!! !